Helmets are an important way to keep soldiers safe. As technology continues to emerge, there is an increasing need to integrate many different capabilities into future helmet systems (e.g., enhanced protection, sensing, information display, and communications technologies). 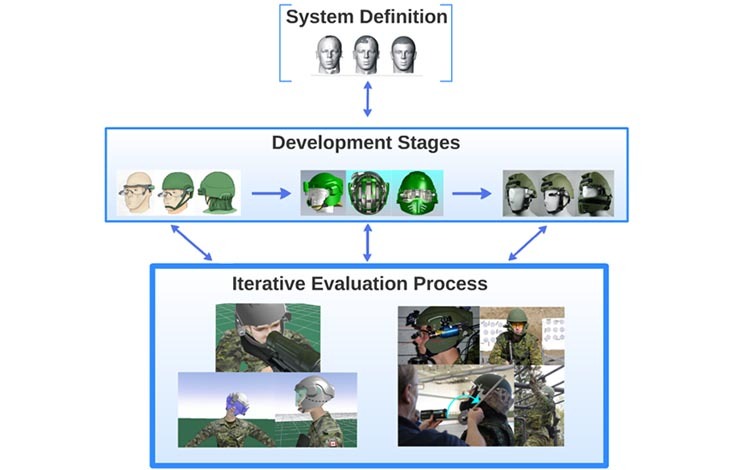 Our clients asked us to empirically determine the most promising headwear integration concept to enhance the survivability and effectiveness of future soldiers. We used an interactive and iterative design process to develop, evaluate and demonstrate new concepts in helmet design. These developmental stages progressed seven head borne concepts, to four digital models, to four physical and functional prototypes. This work will hopefully inform the design of future helmet systems, helping soldiers to perform optimally and to return safely from their missions. This project is a great example of how new equipment or technology should be tailored to the person to ensure maximal effectiveness. In our view, it all begins with asking “What does this person need to do in their job?” and working to build the systems that best support their roles.